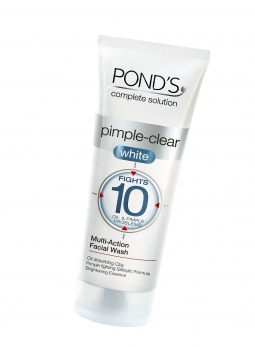 Skincare expert Pond’s, introduces the new Pond’s Pimple-Clear White Facial Wash, formulated with a powerful combination of oil absorbing herbal clay, pimple fighting salicylic formula, gentle beads and skin brightening essence that fights the10 most common oil and pimple problems which we encounter every day. Everyday dirt, oil and pollution settle on the skin surface, leaving dirt and oil trapped if left unattended leading to the breakout of pimples. These unhealthy 'deposits' are also the main cause of clogged pores and blackheads. Available at for Rs.135 for 100 gms, Rs.75 for 50 gms and Rs.30 for 20 gms. Pond’s Pimple-Clear White Facial Wash with multi-action formula fights 10 oil and pimple problems to give you fresh, clear and fairer skin. It includes a powerful combination of ingredients like herbal clay, pimple fighting salicylic formula with gentle beads and brightening essence. Some people are born with perfect skin. Most of us, however, are not. Millions of youngsters in the world suffer from oily skin. Oily skin leads to many different problems like pimples, blackheads, whiteheads, open pores, irritated and rough skin. Moreover pimples leave marks/blemishes behind! All this makes your face look dull and unattractive. 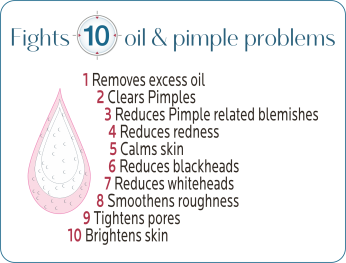 As a teenager, you have to deal with not one, but ten oil and pimple related problems and all this takes a toll on your confidence! Being young is all about living life to the fullest every day and being careless and free. The new Pond’s Pimple Clear White Facial Wash fights 10 oil and pimple problems to give you fresh, clear and fair skin that you always desired. Another product I need to try! I would like to try this facial wash... tnx for sharing hun!!! It sounds great Radha, nice to have you back to blogging. You came back just when I'm leaving to visit family for a few weeks, take care honey. xoxo. my mom was telling me that it has kind of smell in it !! what it is due to?? plz tell me and im dying to buy it ! !plz rply quickly as u can! !